The Valparaiso Men’s chorus at sunset, hoisting their beers aloft and swaying from side to side while belting out lusty sea shanties on the main Chaz Fest stage. Cellist Helen Gillet and her ever-evolving band of Other Instruments making strange and wonderful sounds on the little Hard Liquor Stage under the trees. The party-in-your-mouth that explodes when you take your first bite of Eve and Schatzy’s spicy crawfish bread, and wash it down with vodka-spiked watermelon fresca. Ducking into Zack Smith’s al fresco photo studio, set up behind a tree, and posing for this year’s keepsake portrait while proudly sporting last year’s Chaz Fest t-shirt. These and so many other indelible moments montage through my mind as I look back on a decade of attending my favorite event of the entire Jazz Fest season: Chaz Fest, the scrappy DIY 9th Ward gathering that marks its 10th and final year on Wednesday, April 27 at the Truck Farm (noon-10pm, 3020 St. Claude Avenue). Well, almost a decade of attending. I wimped out the very first year when it rained all over town, save for one patch of blue over the Chaz Fest grounds. “There are weather maps to prove it,” says Chaz Fest founder Alex McMurray, whose ragtag team labored all night cobbling together a sound system and pressing iron-ons onto the very first Chaz Fest t-shirts – designed, as always, by McMurray’s wife, Kourtney Keller. The seat-of-their-pants operation that gave birth to Chaz Fest sprang up out of necessity in 2006, when the town was still reeling from Katrina and the first post-K Jazz Fest rolled around. One of the hardest-working musicians in town, McMurray was living with Keller in one of the houses on the Truck Farm property when Jazz Fest released its schedule. He wasn’t on it, nor were most of his musician friends. So they decided to host their own Fest. The name Chaz Fest was a no-brainer, since it was something they’d joked about for years. But the obvious place to hold it was not immediately apparent. Indeed. Named the Truck Farm because it actually was one years ago, the expansive property is delightfully pastoral and shaded by trees, and includes several rustic outbuildings and sheds. That makes it perfect for the ma-and-pa taco stands and other grassroots enterprises that spring up for one day only during Chaz Fest, like Oliver’s now-legendary backyard Speakeasy. So the writing was on the wall when McMurray announced early this year that the Truck Farm was being sold and Chaz Fest was no more. Longtime fans were crushed and bemoaned the loss loudly in tweets, Facebook posts and funky 9th Ward bars. And lo and behold, the gods heard our cry! The new buyers relented and Chaz Fest came back for one last hurrah – a happy ending that McMurray greeted with his usual ambivalence. Still, he persisted, year after year – well, every year except 2014, when he and Keller took a break from Chaz Fest after their son, Max, was born. (Max attended last year and will be back for the final blowout, giving his babysitter a run for her money now that he’s “more ambulatory,” as McMurray puts it). For while it may be exhausting, both McMurray and Keller enjoy rocking out when their hard work’s finally done. He’s also psyched to welcome back the gypsy-punk-klezmer rockers of Debauche, who incited one of the great moments in Chaz Fest history. This year, Supagroup, Debauche and a dozen other Chaz Fest faves mark the end of an epic era. (See complete lineup here). But McMurray, at least, won’t be crying in his beer. 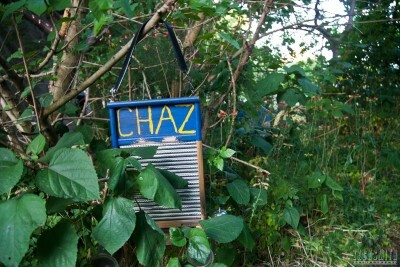 Chaz Fest runs from 12-10pm on Wednesday, April 27 at the Truck Farm, 3020 St. Claude Avenue. Buy advance tickets ($30) here, or purchase them at the door ($35).